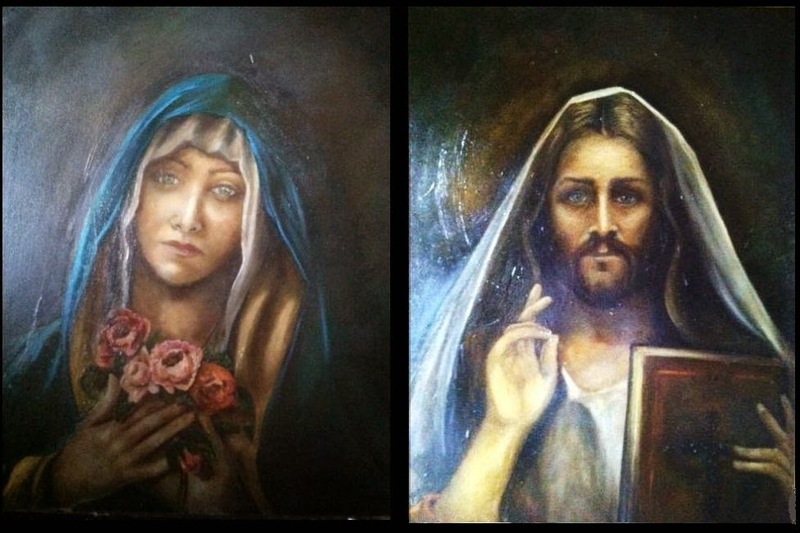 These paintings of Mary and Jesus were intended to be a pair, but the artist has expressed dissatisfaction that they do not look like they go together. Both paintings are oil on canvas. Jesus has received a coat of Dammar varnish; Mary has yet to do so. The artist Anna Strawbridge Ziegler has faced the challenge not only of completing a double portrait, but of making them appear a pair. In order to make oil paintings belong together, it is a good idea to think about the light. Does the light hit the object from the same angle? Is the light of the same intensity? If one differs to the other, the pair is unlikely to appear unified. As can be seen from the two images, the quality of the light differs, and I feel this might be the reason for the artist’s dissatisfaction in making them appear to belong. The face of Jesus has a subdued light, suggesting half-light. The tones are low key and the features almost shrouded in shadow. The portrait of Mary has a higher contrast in tone. We can see her features more clearly, as though light had sought out her features. This contrast in portraits is particularly clear in the eyes – the focal point of any portrait. The artist tells me these are her third and fourth paintings ever completed. From this, it can be seen that the artist has overcome great obstacles, as portraiture is not easy. The result is quite accomplished. To make the portraits appear to belong, the issue of the light needs to be looked into. This can be tackled in two ways: either reduce the contrast and tonal value of Mary’s face, or increase the contrast and tonal values of Jesus. I feel the former will simply result in two subdued portraits, which I feel is not the intention. 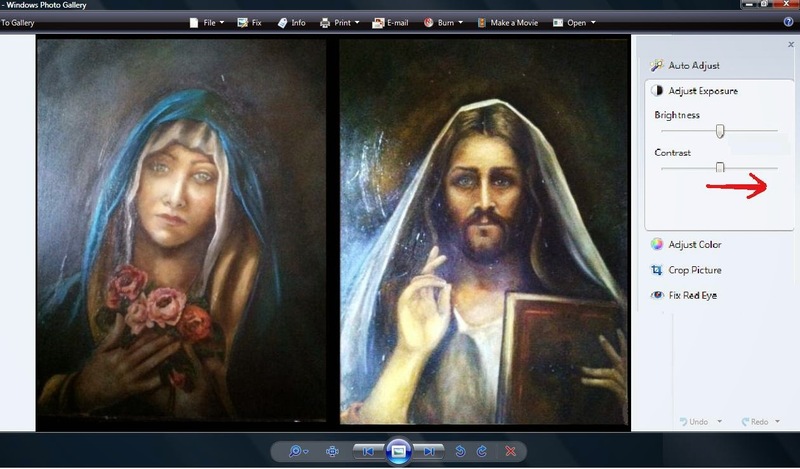 The 2 images on the right shows Jesus' face of differing tonal keys. the one on the right is the original image; the one on the left has been altered by increasing tonal contrast. Altering the tonal key of an image is easy if you know how. The screenshot shows how to do this on Microsoft MyPictures. Simply increase contrast to heighten the tonal key of Jesus. This will bring out the highlights on the face. Don’t overdo it, or detail will be lost within highlights and shadows. Always save the original image. The altered image can then be printed and used as art reference. The altered image of Jesus has been placed next to Mary, creating a better match regarding light than the original. The artist could add a little warmth to the highlights of Jesus' face by adding a little burnt sienna to the mix. The dark backgrounds will really bring out the tones on the features. With the tonal values of the photo heightened, the artist can move forward in one of two ways: either begin the Jesus portrait afresh or work over the original one in an upper glaze. Working in an upper glaze means using thinned oil paint (usually with a little linseed oil) over select areas of the portrait. 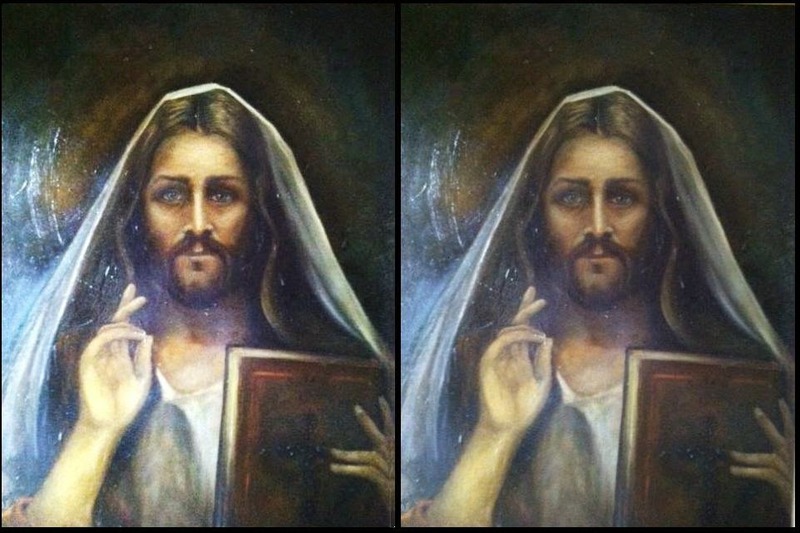 In this case, a paler color can be worked around the brow, cheeks, nose and chin of Jesus’ face. Using the altered image can be used as a guide. Blend out the edges of the highlight areas with a fine sable to create smooth gradations into shadow. It must be noted that Jesus has already received a coat of Dammar varnish. Never apply oil paint on top of varnish. It is better to remove the varnish with special varnish remover (not turps or industrial thinners) before proceeding. Follow manufacturer's instructions. I use cotton buds and work over the painting little at a time. Look out for any oil paint that lifts with the varnish. If this happens, the painting has not dried properly before the varnish has been applied. It might be best to start a new painting in this instance. In order to make two paintings appear as a set, ensure the lighting conditions and the background colors are similar to one another. 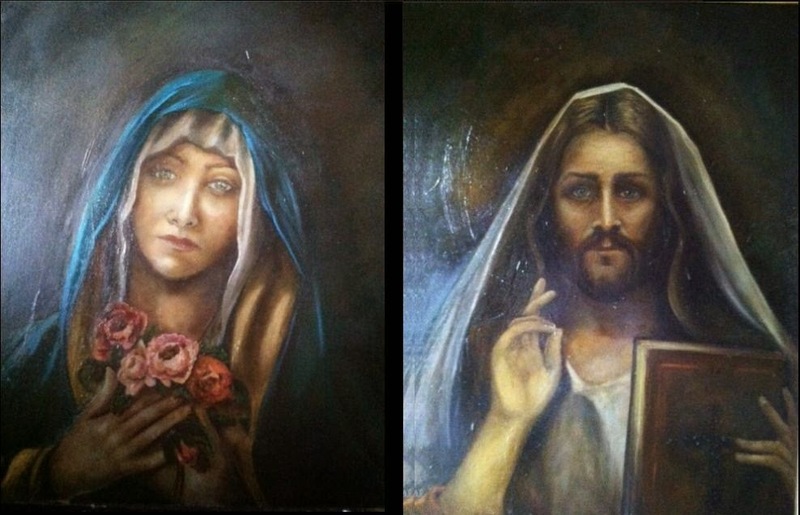 In this case, we can see the light has different qualities in these portraits of Jesus and Mary. 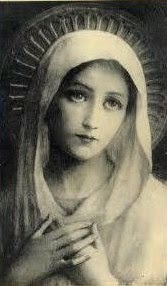 Jesus’ face appears shrouded in shadow and lower key by contrast to Mary’s. This can be put right by increasing the contrast of Jesus’ face. 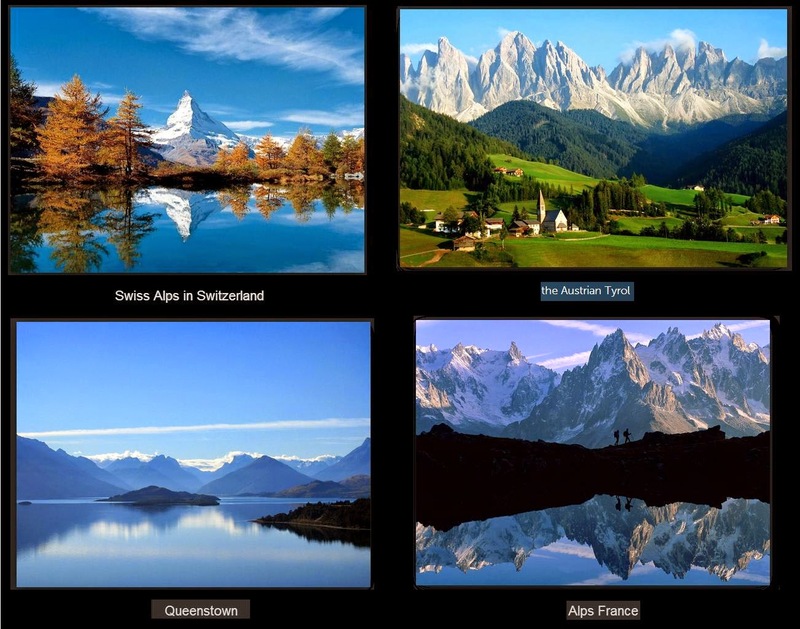 MyPictures, Microsoft’s standard program can be used to do this. The photo can then be printed and used as reference for the painting. The highlights can then be worked over select areas in a light glaze or begun afresh. I am most excited about a book talk I will be hosting at Coventry Central Library that will be preceded by a radio interview with Phil Upton of BBC Radio. My book talk is to take place at Coventry Library on Tuesday 8 July at 10.30am. 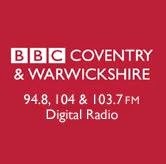 BBC Radio Coventry will mention the event on the morning prior to the event. The book talk will really be in two parts, the first being about my art instruction books. I will show the audience examples of the troubleshooting guides I have been writing to help students with their creative pursuits, such as Why do My Ellipses Look Like Doughnuts? And Why do My Landscapes Look Like Cotton Wool? Original artwork will be on display for people to look at, and I will have copies of my first art instruction book published, entitled, Oil Paintings from your Garden, at only £2 each. The second part of this talk will comprise the psychological thrillers that I write under a pseudonym, Charles J Harwood. I will talk a little about how I got into writing and also read an excerpt from one of my thrillers, Falling Awake. After a break I can answer questions the audience can pose me, but will post any on my blog that I am unable to answer at that time. My thrillers are £6 each (cheaper than Amazon) and all will be signed. If there is time, I will relate on my personal experiences of book publishing. I am looking forward to the author event, and also the chat with Phil the preceding evening. Hopefully, I will remember my lines and get the word about! See you there. An oil painting with perpendicular structures such as this scene of Pompeii poses the issue of perspectives. Getting perspectives right can cause the artist to get sidetracked. Surrounding areas such as the sky could be in danger of being overlooked. 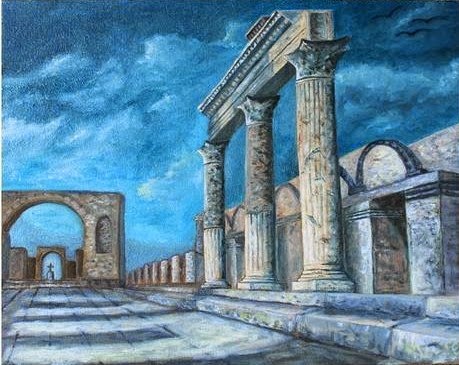 This challenge was faced by Elizabeth Murray when painting this scene of Pompeii oil on canvas. 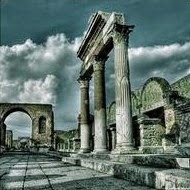 Pompeii is located near Naples in Italy. The town was destroyed by the eruption of Mount Vesuvius in 79 AD, burying its occupants within a pyoclastic flow. The town was rediscovered after 1,500 years and the buried remains preserved, creating a tourist attraction. Only a ruin remains. The painting style reminds me a little of De Chirico’s scenes in the repeating arches and shadows and the muted color of the sky, although the paint handling is softer than De Chirico’s style. Great handling of perspectives is evident here. 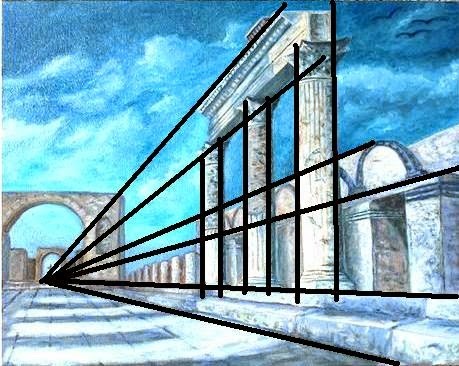 The columns are vertical and the supporting struts recede to a vanishing point that makes sense, as can be seen by the image overlaid with dark lines. Some paintings featuring straight lines can look rather draughtsman-like, but is not the case here. The columns appear soft, almost rendered by pastel and shadows appear to melt into the sunlit areas. 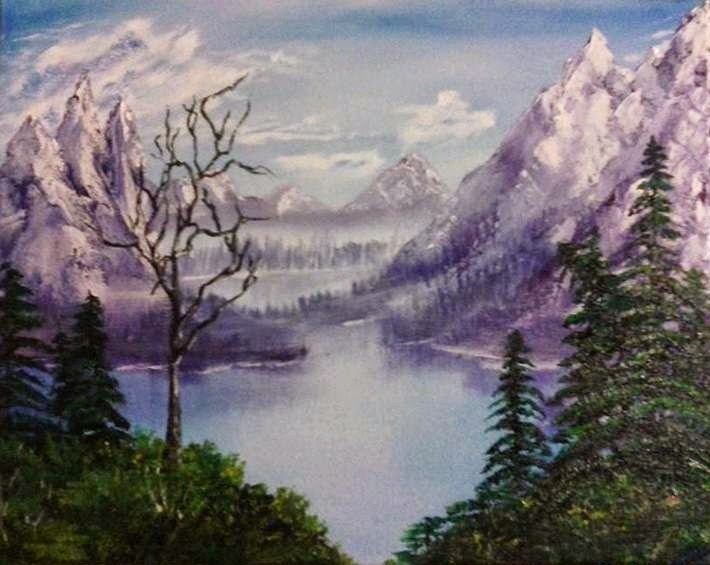 As the artist is a beginner, is a great achievement. The only (slight) issue is the arches in the foreground appear to lean forwards. This is because the arches (including one in the background) aren’t quite symmetrical in formation and apex of some appear too far to the left (see close up images). This problem is minor and can easily be fixed. This painting appears to be completed with a limited palette, for the muted colors. This provides the ideal opportunity to explore textures. In this vein, the artist has requested tips on getting high detail in the buildings. A good way is to apply paint thinned with a little linseed oil from a fine bristle (number 6 or 3) over the base color. A sable may not possess the robustness required to deal with the rough surface of canvas and may not get into the weave. Erosion can be suggested by smudging out the paint slightly and applying fine marks on select areas as guided by the photo. Oblique sunlight can bring out the imperfections in the stonework. 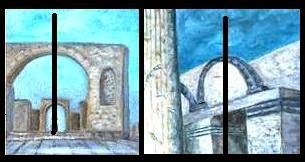 Applying neat white (with perhaps a tiny dab of burnt sienna to create warm highlights) can be ‘skimmed’ over the palest areas of the columns to really bring them out. The same treatment can be used for the darks. Skimming an uneven paint layer can suggest the erosion of old relics, particularly on canvas. Depth of tone can be achieved by deepening the darkest areas of the monuments, but only on select areas as revealed on the photograph. Exacting detail, such as the carvings on the uppersides of the columns could perhaps be dealt with on separate sessions. A painting featuring lots of detail can be completed on several session, an hour or so each. Never try to rush detail in a bid to complete the painting. Illustrating detail on buildings requires one thing: a clear photograph. This allows no guesswork when applying the paint. Textures and pigmentations can be clearly seen and copied. If something doesn’t work right, the paint can be smudged off with the corner of a rag and detail can be reapplied on top. This is the beauty of oil paint. A large part of the composition consists of the sky. If much time and energy is spent upon the buildings, the sky aspect can become overlooked. This can result in a rushed looking sky or one that appears empty. Although this is not really the case here, the artist has expressed dissatisfaction with the sky. The answer is to foresee such a problem before spending too much time on foreground detail. A painting that features large areas of sky requires forward planning. That the light hits the clouds from the same angle as the other objects within the scene (ie, from the left or right or from above). That the sky appears to be of the same time of day (ie, evening or afternoon). That the sky exhibits similar weather conditions (sunny or inclement). That the sky could inhabit that portion of sky (ie, it is no good sticking clouds at the zenith onto a horizon). Look for an interesting sky. I like skies with textures, such as mackerel sky or cumulonimbus. A simple sky can be interesting, such as a mostly blue sky with a few wispy cirrus clouds. Clouds with definite tones (lights and darks) could be used to echo the textures of the buildings. Rather than change the sky in this painting, I would start afresh, as the soft clouds add contrast with the rigid lines of the monuments. Painting breathtaking scenes poses one huge challenge: conveying the awe into an oil painting. How does the artist squeeze such wonder onto a small panel? 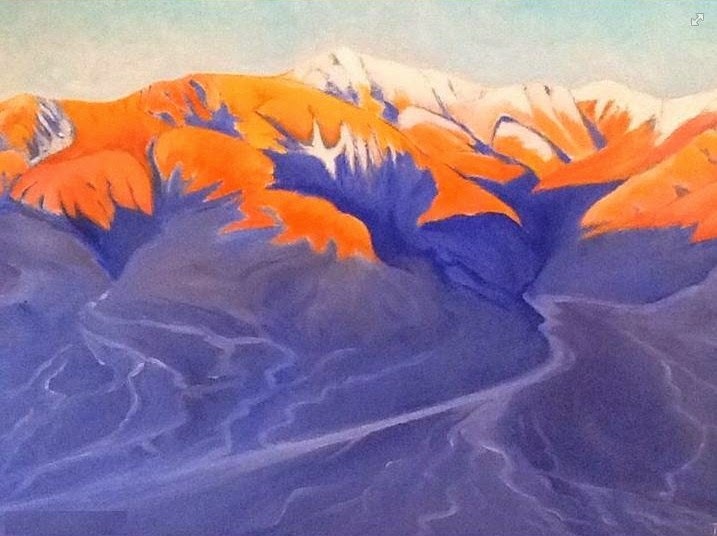 This painting of sunrise over Telescope Peak in Death Valley posed just such a challenge for artist Jennifer Tuininga Kennedy. Telescope Peak at over 11,000 feet overshadows Badwater Basin, Death Valley’s lowest point. Its slopes boast the most vertical climb within the national park but will reward a view of Mount Whitney and Charleston Peak over a hundred miles away. Hence the name, Telescope Peak. The strength of this painting can be seen in how the artist has selected detail from the photograph to create a more dynamic composition. The photograph itself contains too much information without a particular focal point. A straight copy would have resulted in a muddled painting without anywhere for the eye to go. However, here, the artist has selected part of the photograph to create a forceful composition through focal points and visual channels. This has been clarified by the image overlaid by dark lines. The eye is led into the valley via a track that runs from left to right. This is balanced out by jagged peaks and cols. Here we can see the artist was keen to convey the vividness of the sunlit peaks as sunrise, which in real life must have been surreal. By contrast, the violets and mauves within the shadows would appear to almost shimmer against the oranges. Such vivid hues in real life will often cause the artist to reach for the most vivid colors the palette can offer. The result however may cause disappointment at how this vivid color does not reflect what was seen in real life. 1 The colors of real life are often not as vivid as our minds lead us to believe. For instance, green grass is often not the pure green of viridian. Take a photograph and cut out the green part, and on close inspection may appear a little brownish or blue or even grey. A blue sky will often contain pinks and yellows. A color’s local color (the color by which it is labeled) will often differ to how it appears in reality under various lighting conditions. 2 Bright colors, being a focal point are often in danger of being perceived in isolation of its surroundings. Bright colors must be balanced out with its neighboring colors to make sense. This means making comparisons. Is it cooler/warmer than the next hue? Is it more muted? 3 Finally, a painting comprises two aspects: color value and tone. Bright colors may cause the artist to forget about the tonal value of that color – i.e., how light or how dark it is. Tonal value gets overlooked by the color’s vividness. But how can these issues be put right? This painting comprises steep shifts in hue between orange and violet. Such bizarre color shifts may cause tone to be forgotten. The shadow colors are quite close to the hues exhibited in the photograph; sensitive observations in tone can be seen within the contours of the foothills. Similarly, the sky color is accurately portrayed. However ,the artist has expressed dissatisfaction with the sunlit peaks. We can see from the photograph that the pinks are in fact quite muted and similar in tone to the sky color. The oranges within the painting are deeper in tone and very bright, causing this color to appear to advance instead of receding. My suggestion is to work over this area with thin oil paint (or start afresh if preferable). Use a stiff brush to work a little oil paint over the existing colors but go easy on the linseed oil to maintain opacity, as the color underneath could show through. During the over-painting, notice how the soft, dusky pinks of the peaks appear to almost melt into the sky without harsh outlines. For the sunlit peaks: a little burnt sienna and permanent rose (to achieve a warm, pinkish hue). Introduce a little ultramarine for the pale violets. 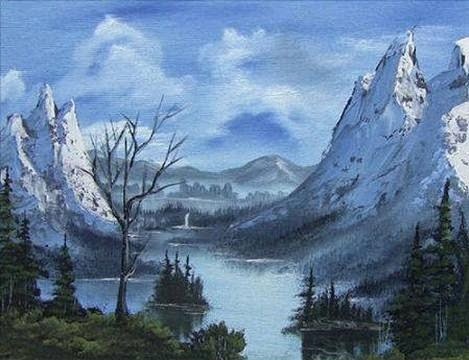 Most importantly, adjust the tonal value of the peaks until it is quite similar to the sky. Keep looking at how this tone compares to its neighboring color. For the shadowed foothills: ultramarine, permanent rose (and a little burnt umber to temper violet overkill in select places). A little burnt umber and ultramarine can be used for the darkest areas such as the foreground and deepest shadows. Pthalo blue, cobalt (or similar cool blue) can be added to the mix for cooler blues within the shadowed foothills. Soften the shadow colors on the foothills (not all) to express the transition between shadow and sunlight. A little sharp detail will be needed for the crags. Neat white via a fine sable can be used to express the snow. But add a little cobalt (or similar cool blue) to express snow in shadow. Bizarre colors can often be seen in dramatic landscapes which can cause the artist to reach for the most vivid hues to express the experience. The reality is that the color is more muted than is led to believe. 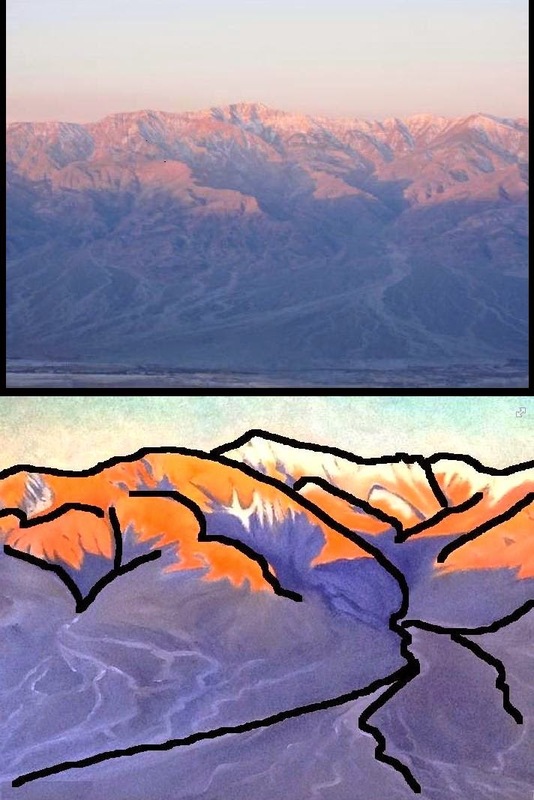 This is a common problem with painting beautiful landscapes such as this scene of Telescope Peak in Death Valley. The secret is to take note of the color’s tonal value and how it relates to neighboring colors. A vivid color in isolation will make little sense if it has no balance with its neighbors. 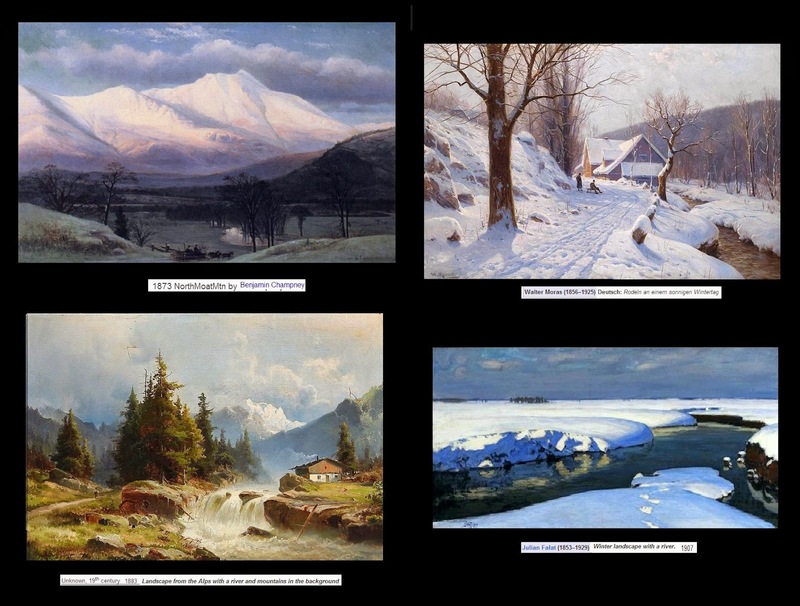 Fortunately, this problem can easily be put right by working over select areas of the painting (in this case the sunlit peaks) with thin oil paint. By addressing how tones and colors relate to one another within a landscape painting, other problems often get resolved.